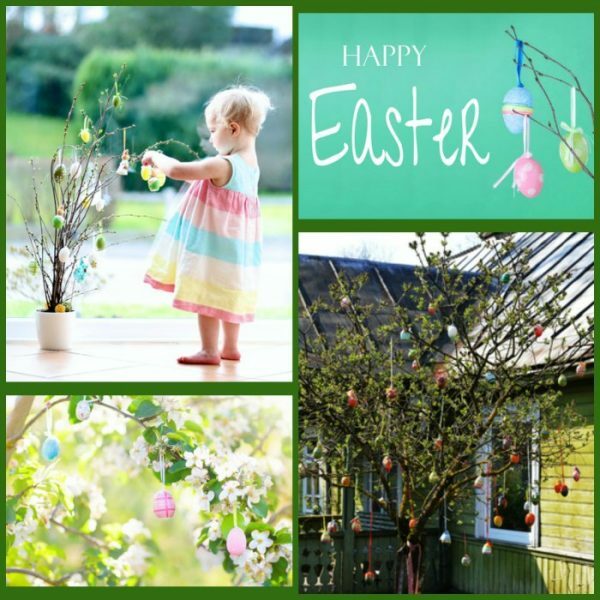 How to Make an easy Easter Egg Tree a family tradition to share with your kids! We can thank the Germans for the tradition of the Easter Egg Tree. 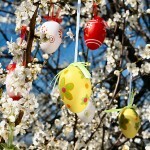 They have been decorating trees with colorful eggs for centuries. No one is quite sure about the reasoning behind the Easter Egg Tree or exactly when the tradition started. It may have begun as a secular practice with pagan roots as the egg was an ancient symbol of life. 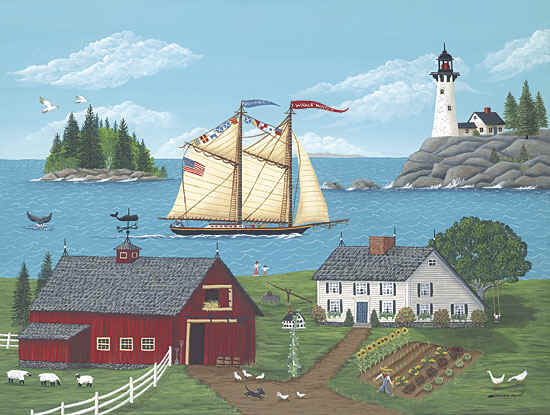 Spring was a time to celebrate new life as nature renewed itself so it became associated with Easter. 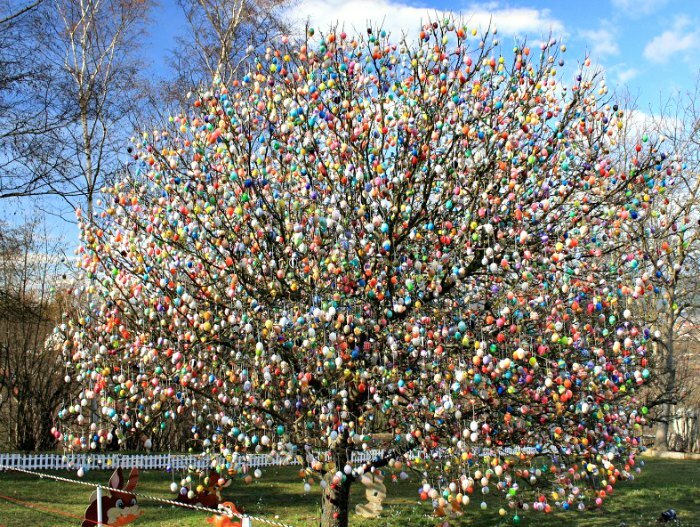 The Germans call the Easter Egg Tree, Ostereierbaum. The best known Easter Egg Tree is the amazing apple tree decorated by the Kraft family in the German village of Saalfeld in the Thuringia region. It is said to have more than 10,000 eggs on it. I wouldn’t want to be the one who had to count them all!! First decision – inside or outside tree? An outside tree can be simple, quick, inexpensive and possibly the easiest to do with young children as it doesn’t have to have the detail of an inside tree. The outside tree is meant to be appreciated from afar. And you don’t have to have a tree as a deciduous shrub can serve just as nicely. 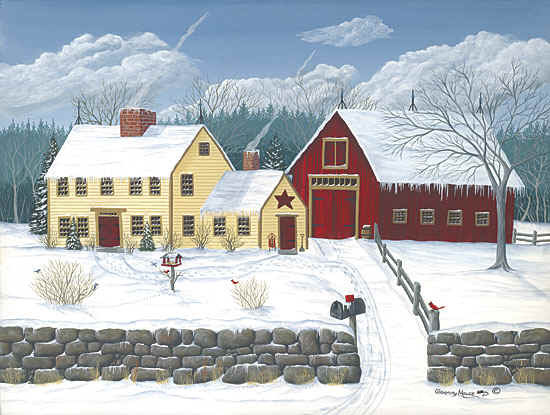 Egg ornaments must be weather, durable and bright. They really don’t need the detailed dexterity that a more sophisticated inside tree would need so they are great fun for toddlers and preschoolers who will be able to hang their eggs on the tree with the pride of what they have accomplished. 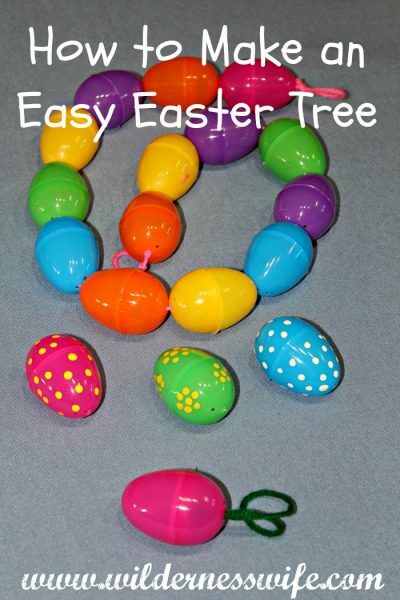 Make a Quick, Easy and Inexpensive Easter Egg Tree with your kids! 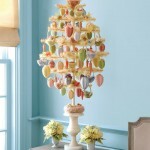 Your Easter Egg Tree does not have to be ornate or even time consuming. 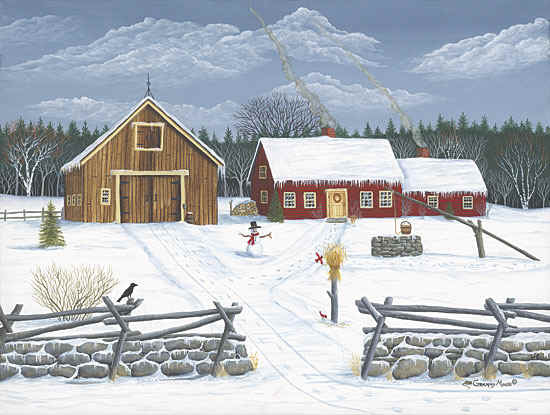 In fact the less “Martha Stewart” you are the happier the kids will be. For our easy outdoor Easter Egg Tree we headed to the local craft store to pick up some plastic Easter Eggs, some colorful yarn, and acrylic paint. This project is meant to be as easy as possible for parents and their young children, and easy on the pocketbook. Kids love being able to participate rather than just watch, so making this egg tree is a family project that everyone can have a part in. That’s it for supplies and equipment. Mom or Dad should make the holes in the eggs for safety’s sake. The plastic eggs we got already had two small holes in each end but the holes were off-center and not usable for what we needed. However there was a dimple in the center of each egg end that we drilled through easily. We used a teriyaki skewer to help remove the nubby burs from the drilled hole. Be sure to cut off the sharp point on the skewer when working with young children. 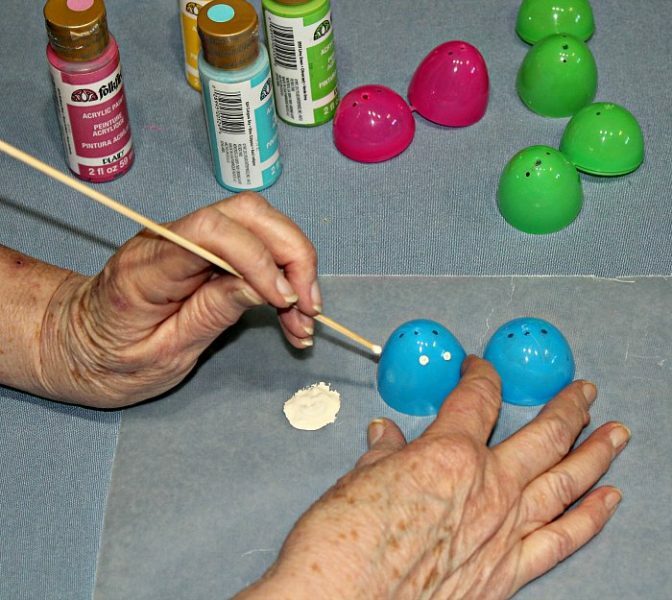 Then comes the fun part that the kids will really enjoy – decorating the eggs. Be sure to protect your table surface with newspaper or waxed paper as accidents will happen when young kids are combined with paint. 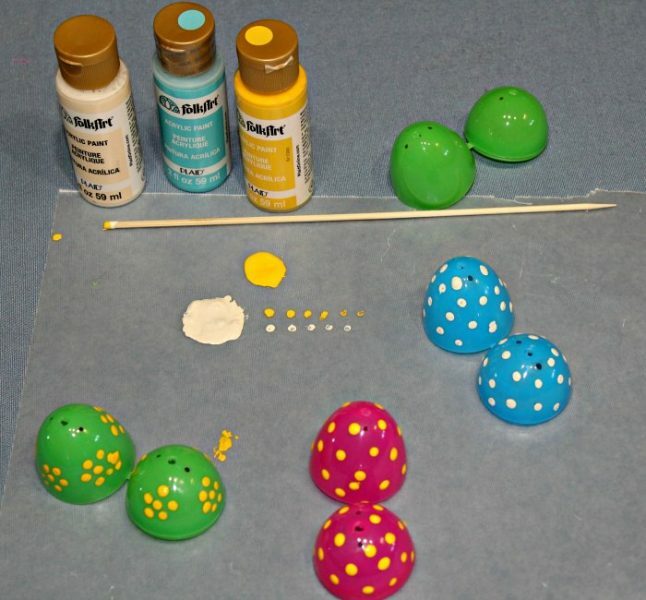 For kids making paint dots is easy and quick. Squirt a puddle of paint onto the wax paper. Put the skewer/dowel end in the paint and then touch it to the egg. 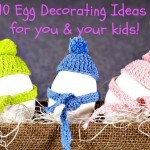 Simple polka dots all over the egg is easy and fun for the youngest. Kids with a little more dexterity can make clusters of dots for flowers. Let the dots dry which may take an hour or two as they are thick paint. The drying process is going to be the hardest for the kids! Next insert the string or yarn (just be sure that it is waterproof for the outdoors). 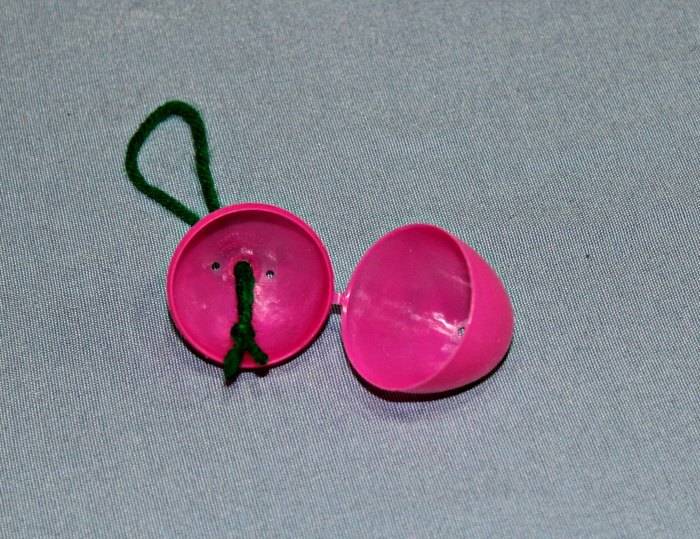 Insert both ends to make a loop and tie a knot on the inside part of the egg. Dependent on the size of the hole you made, you may have to make a double knot. Put the egg back together and its ready to hang on the tree. Now all you have to do is hang the eggs on the chosen tree. 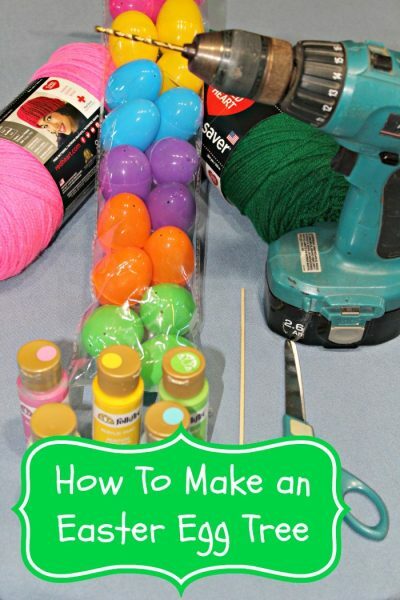 Another fun and easy Easter Egg project for the kids is to make an Easter Egg Garland. 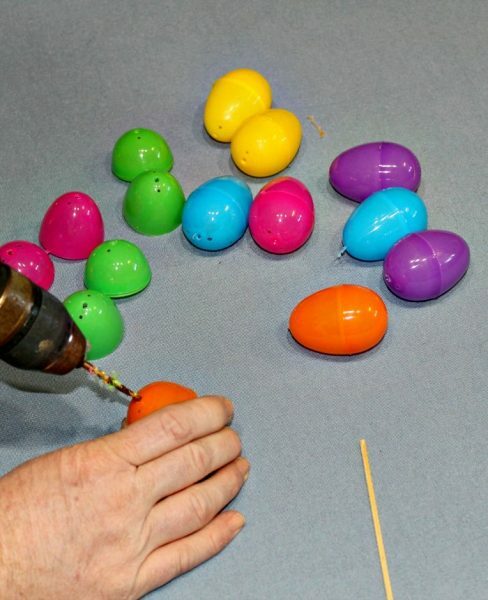 Drill holes in both ends of the plastic Easter Egg. Then it is as simple as stringing the plastic eggs together and making a loop at each end of the garland for hanging. With young children the projects do not have to be complicated or expensive but the time spent doing it as a family is PRICELESS!!! Its the stuff that childhood memories are made of. So make some memories this Easter!